From the time I was in elementary school all the way through graduate school, I was not a morning person. In fact, I hated to get up any time before 10am. But then I began working and I had to rise and shine. To get my workouts in before leaving each day, I had to wake up even earlier! Rather than resist it, my body actually enjoyed the new hours, and my internal clock changed. Now, I can't stay in bed past 6:30 am without getting antsy. I have come to love mornings, the earlier, the better. The quiet, the solitude, the light... I love it all. My dogs are morning dogs too. 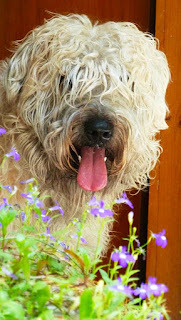 They accompany me on my stroll through the garden... doing the occasional "bad dog" thing...But having fun nonetheless. 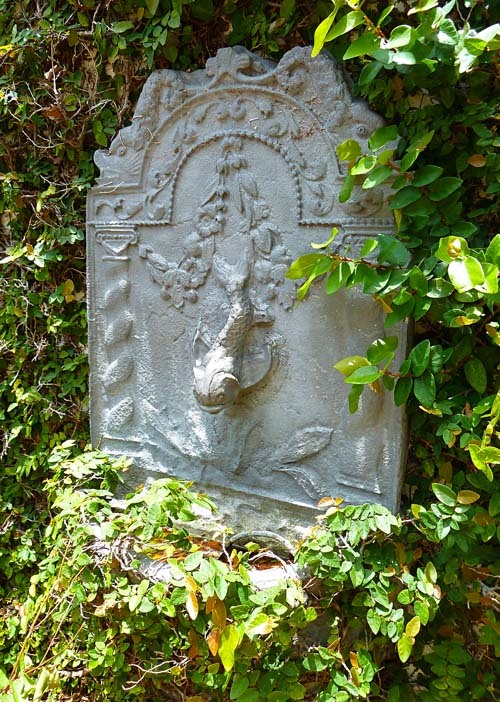 Morning has become a quiet and meditative time of day for me. A time of day which I savor as much as my meals. In the old days, when I didn't rise early, breakfast meant little to me. I went straight into lunch. But now, I love breakfast as much as early morning. And although I love pancakes, bacon, and eggs, I more frequently have a healthy breakfast of fruit, cereal, and yogurt. I have tried many breakfast cereals over the years and there are a few that I enjoy. But nothing beats putting my own together since I get to choose the ingredients and control how much sugar I add to the mix. 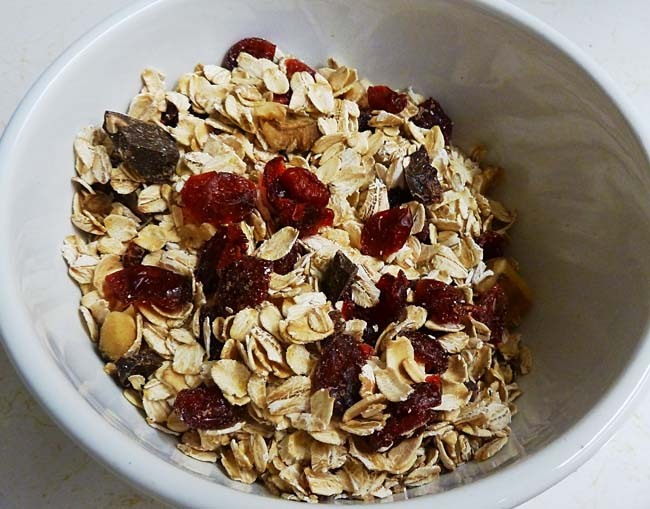 One of the easiest and healthiest cereals you can make is muesli (pronounced myoos-lee or myooz-lee). According to Reference.com, muesli was created by Swiss physician Maximilian Bircher-Benner who was a great proponent of the healthful benefits of raw fruits and vegetables during a time when meat and white bread were the staples. Since his invention in the late 19th century of muesli, there have been many variations of the recipe, most of which are quite different than his original combination. 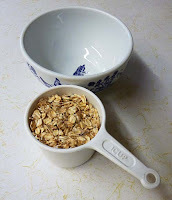 To see Dr. Bircher-Benner's original recipe go to Reference.com at http://www.reference.com/browse/Muesli?o=100082. My muesli is a little more decadent than his and totally delicious. This recipe is also a dry version of muesli. Some recipes call for the dry mix to be soaked in or moistened with milk, yogurt, cream, fruit juice, or other liquids from the beginning. I like to keep mine dry because it keeps longer and you can take it with you as trail mix too. 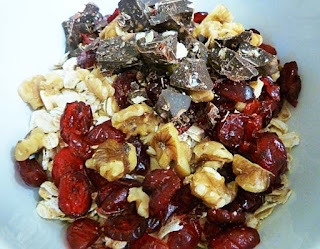 In this recipe the chocolate which I use, and highly recommend, not only for its superb taste, but because it truly complements this recipe for muesli, is Chocolove Cherries & Almonds in Dark Chocolate. The company is out of Boulder, Colorado and the folks there had the heart to distribute bars of their delicious chocolate to displaced homeowners during the fires outside of Boulder last year. It was there that I first became familiar with their product. Not only are these decent folks, caring for their community, but they make excellent chocolate! For information on where to buy this chocolate, go to their website at: http://www.chocolove.com/index.html. 4 squares (about a half ounce) of Chocolove Cherries & Almonds in Dark Chocolate, chopped. If you don't have this chocolate, you can replace it for another brand of dark chocolate. If you can find one with almonds or dried fruit, that would be best. 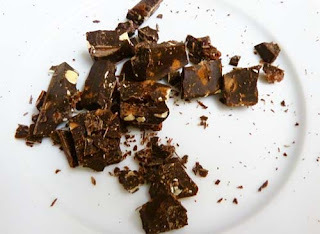 Otherwise, plain dark sweetened chocolate works. 1-2 Tsp brown sugar. I think that the dried fruit and the chocolate sweetened things up. So I don't tend to add much brown sugar to the mix. In a bowl, combine the rolled oats, dried cranberries, chopped walnuts, chopped chocolate and brown sugar. Mix the ingredients well and move to an air tight container. You can leave it overnight to let the flavors blend prior to serving it for breakfast. I enjoy this simple mix of muesli, but you can also add other ingredients, such as dried chopped figs, dried chopped dates, pumpkin seeds, sunflower seeds, oat bran, toasted wheat bran, golden raisins, dried strawberries, dried mango, dried blueberries, dried chopped prunes... it's endless! Traditionally, when you serve the muesli, you add milk, cream, yogurt, or fruit juice. You can also be more creative and add hot chocolate or even coffee! Also, if you want to incorporate fresh fruit in the mix, add it just before serving. It's delicious with apples, bananas, strawberries, blueberries, or raspberries. Muesli is a wonderful way to power-up your mornings. The combination of ingredients will keep you going well into lunchtime! Now I know what I missed by sleeping in late! Your dog is sooo cute :) What's his name?